To start I was not sure how I would be able to understand about the Zodiac killer from only reading this book and from a few facts I had found out from different sources. This book gave an in-depth view of the case and the people involved. 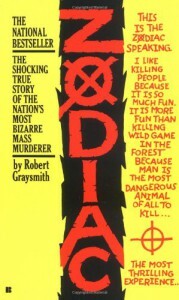 The narrator was a newspaper cartoon artist who becomes obsessed with finding out who the Zodiac is. He included personal accounts he had with the police and others involved with the case and also the letters the Zodiac sent to the newspapers. Overall I give it a 4/5.